Anywho, tomorrow is my preschool’s Halloween parade. 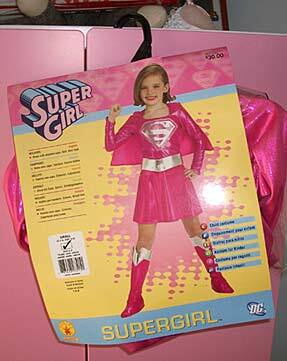 I’m SO ready to put on my store-bought Super Girl get-up and run around blowing off some steam with my friends. Normally I’d be bummed that my costume comes off the rack. But D.I.Y. and my M.O.M. do not mix. A friend in my ‘hood who just turned 2 has a mom who managed to make hers. It looks awesome. Apparently her mom knows how to sew. 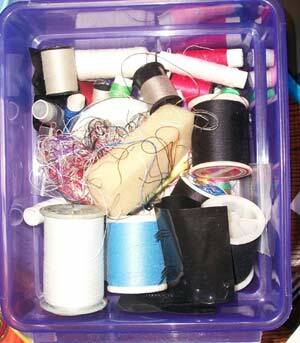 If you need proof of her inability to wield a needle look no further than her sewing kit. It’s simply a tangled mass of thread. Looks like a freaking bird’s making a nest in there. Obviously, any costume she’d try to make me would have me looking like a mental patient. News flash: The One Flew Over the Cuckoo’s Nest costume was not on my list. Tags: costumes, DIY, halloween, humor, preschool | Permalink.